This gene encodes a member of the peroxisome proliferator-activated receptor (PPAR) family. PPARs are nuclear hormone receptors that bind peroxisome proliferators and control the size and number of peroxisomes produced by cells. 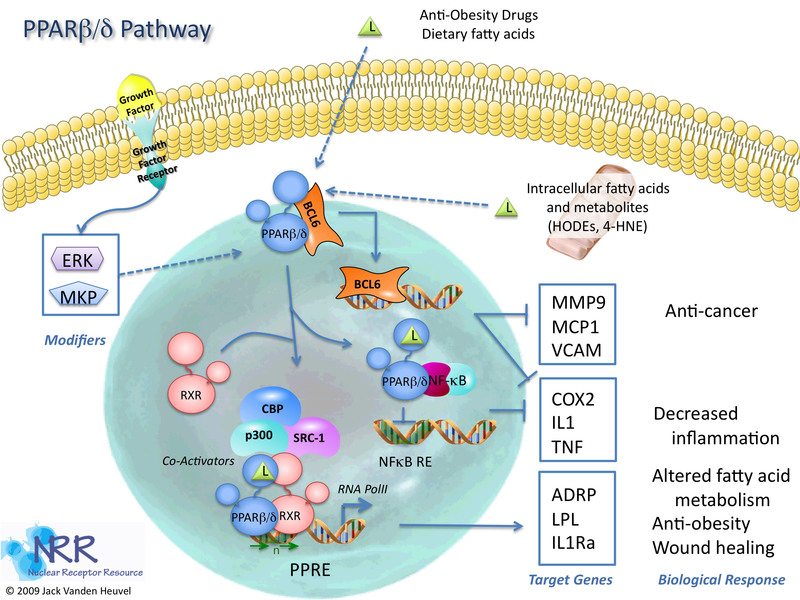 PPARs mediate a variety of biological processes, and may be involved in the development of several chronic diseases, including diabetes, obesity, atherosclerosis, and cancer. This protein is a potent inhibitor of ligand-induced transcription activity of PPAR alpha and PPAR gamma. It may function as an integrator of transcription repression and nuclear receptor signaling. The expression of this gene is found to be elevated in colorectal cancer cells. The elevated expression can be repressed by adenomatosis polyposis coli (APC), a tumor suppressor protein related to APC/beta-catenin signaling pathway. Knockout studies in mice suggested the role of this protein in myelination of the corpus callosum, lipid metabolism, and epidermal cell proliferation. 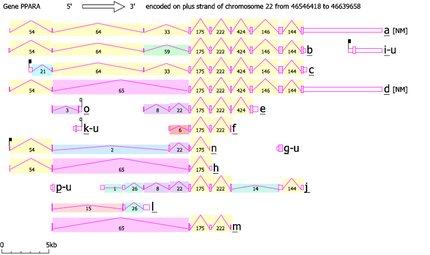 Alternate splicing results in multiple transcript variants. There are 165 articles specifically referring to this gene in PubMed. 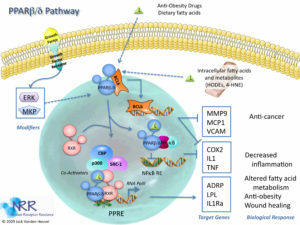 Functionally, the gene has been tested for association to diseases (Arteriosclerosis; Breast Neoplasms; Cholesterol, HDL/blood*; Chronic Disease; Diabetes mellitus, type 2; Dyslipidemias; Fasting; Hyperplasia; Inflammation; Intestinal Neoplasms and 3 others), proposed to participate in pathways (Acute myeloid leukemia, Basic mechanism of action of PPARa PPARb(d) and PPARg and effects on gene expression, Pathways in cancer, PPAR signaling pathway, Wnt signaling pathway) and processes (adipose tissue development, anagen, axon ensheathment, cell differentiation, cell proliferation and 14 others). Proteins are expected to have molecular functions (DNA binding, fatty acid binding, metal ion binding, NF-kappaB binding and 5 others) and to localize in various compartments (cytoplasm, nucleus). Putative protein interactors have been described (BCL6, CEP350, DUT, EP300, GADD45B, GADD45G, HDAC1, HDAC2, HDAC3, HDAC4 and 16 others). PPARδ Reporter Cells are prepared using INDIGO’s proprietary CryoMite™ process. This cryo-preservation method yields high cell viability post-thaw, and provides the convenience of immediately dispensing healthy, division-competent reporter cells into assay plates. There is no need for intermediate spin-and-wash steps, viability determinations, or cell titer adjustments. The principle application of this assay product is in the screening of test samples to quantify functional activities, either agonist or antagonist, that they may exert against the peroxisome proliferator-activated receptor. This kit product is an all-inclusive assay system that includes, in addition to PPARδ Reporter Cells, two optimized media for use during cell culture and (optionally) in diluting the test samples, a reference agonist, Luciferase Detection Reagent, a cell culture-ready assay plate, and a detailed protocol. The gene contains 37 distinct introns (34 gt-ag, 2 gc-ag, 1 other). 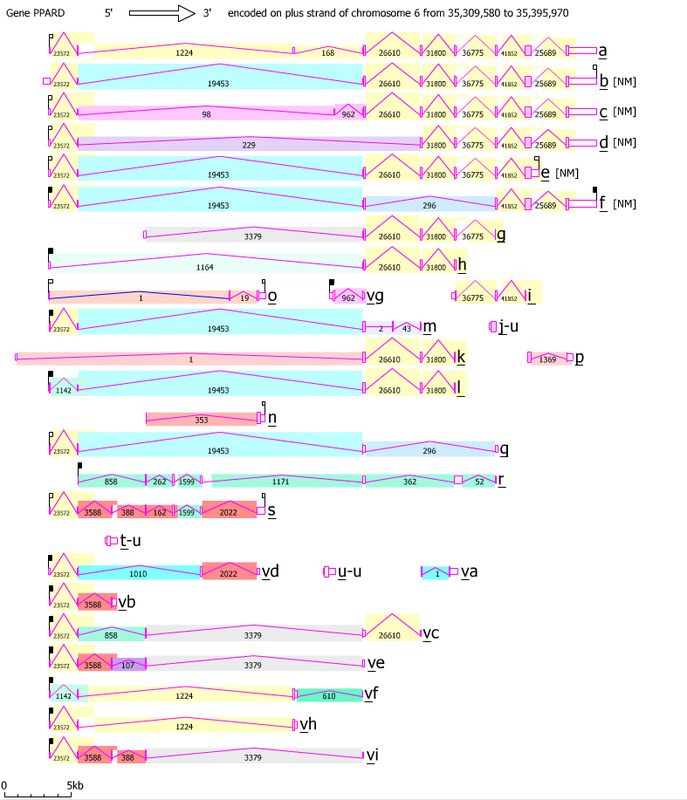 Transcription produces 30 different mRNAs, 27 alternatively spliced variants and 3 unspliced forms. There are 6 probable alternative promotors, 9 non overlapping alternative last exons and 6 validated alternative polyadenylation sites (see the diagram). The mRNAs appear to differ by truncation of the 5' end, truncation of the 3' end, presence or absence of 19 cassette exons, overlapping exons with different boundaries. 366 bp of this gene are antisense to spliced gene yosiya.bAug10, raising the possibility of regulated alternate expression. Note that mRNA .qAug10 was found in vivo, although it is a predicted target of nonsense mediated mRNA decay (NMD). Efficacy of translation may be reduced by the presence of a shorter translated product (uORF) initiating at an AUG upstream of the main open reading frame (in variant aAug10).